Cell Proliferation Staining Reagent - Deep Red Fluorescence | Cytopainter (ab176736) is a powerful tool to analyze heterogeneous cell populations where multicolor analysis is required. This reagent is designed to label cells at Em = 628-643 nm excited with a red laser at Ex = 633 nm. The CytoLabeling Red Reagent dye contained in this kit is functionally similar to CFSE and can be used for the multicolor applications where either GFP or FITC-labeled antibody is used, since the CytoLabeling Reagents staining reagents have either excitation and emission spectra distinct from CFSE and its fluorescein analogs. This product can be used for imaging or flow cytometric analysis. Uniform labeling of live cells with a dye containing a cell-retaining group to allow retention in proliferating cells. It enables multicolor labeling and functional analysis of live cells in combination with other fluorochromes. The dye is retained for up to 9 generations after staining. Emission and Excitation spectra for CytoPainter Cell Proliferation Staining Reagent - Red Fluorescence (ab176736). Cell tracking assay with CytoPainter Cell Proliferation Staining Reagent - Red Fluorescence (ab176736). Jurkat cells (2x106 cells/mL) were stained with ab176736 on Day 0. 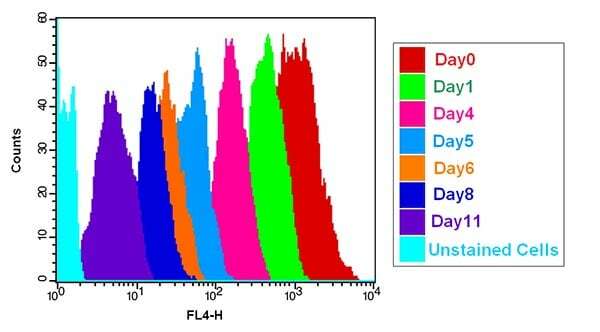 The cells were passed serially at 1:1 ratio for 11 days. Fluorescence intensity was measured with a flow cytometer in FL1 channel on the day after passage. Successive generations were represented by different colors. Publishing research using ab176736? Please let us know so that we can cite the reference in this datasheet. There are currently no Customer reviews or Questions for ab176736.